Why Does Batman Carry Shark Repellent? is the latest book from Brian Cronin, author of Was Superman a Spy? and the long-running Comics Should Be Good. In his new book, Cronin pulls out all sorts of comic ephemera and collects them into lists like "Nine Goofiest Moments in the First 20 Issues of Batman" and "Four Comic Book Creators Who Have Received Death Threats over Their Work." He also includes some similar lists from comic creators like Mark Waid and Dave Gibbons, and a few Top Rated lists based on some online surveys he conducted over at CBR. As one might expect if you're familiar with Cronin's work, he doesn't just simply everything out with a series of bullets, but provides explanations and context for everything. Some of the anecdotes he includes were ones I was already familiar with, but many were not. Drops of KISS members' blood in the ink used in their comic? Knew that, seen the publicity photos. That two separate MLB players were nicknamed Flash Gordon? News to me. Bob Kane repeatedly swiping from Gang Busters in Action? Seen those. The guy who claimed he was working on the next issue of Wolverine: Origins while talking with Mike Deodato, who was the artist actually working on the next issue of Wolverine: Origins? Hilarious, but I'd never heard that. I suspect that there's something in here that's new to just about everyone. Cronin's casual writing style here fits the subject matter well. It's light-hearted, and generally meant to be taken with a bit of a wink and a nudge, as suggested by the title. The individual pieces are concise, and worked really for me this past week when I only had a few moments to spare here and there. I could read a page or two and be done with that piece, or go on for 20-30 minutes if I had more time. While the lists are grouped into broad topic areas, they don't necessarily have to be read in any sequence. Honestly, I did find some of the creator lists a bit distracting because they often took a decidedly different (i.e. more serious) tone than Cronin, although I did appreciate some of the personal anecdotes they included as well. I received a copy of the book from the publisher, but I don't think I'm really the best target audience for it. I was going cite my biggest complaint was an emphasis on Marvel and DC, but as I think on that, it makes sense for the type of person this book is aimed for. 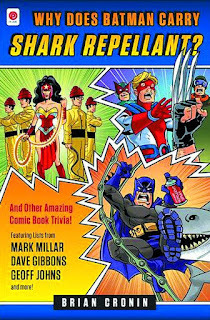 It's written very much for readers who are regularly picking up monthly superhero comics and enjoy the kitsch factor in some older comics featuring their favorite characters. It's not really for people looking for wholly new (to them) material; it's for people looking for new (to them) material about a character they already know. The goofiest moments of Batman. Characters who've wielded Thor's hammer. The weirdest powers of Superman. Even with list titles that frequently include words like "weird", "strange" and "goofy", there's no mention of Fletcher Hanks anywhere. 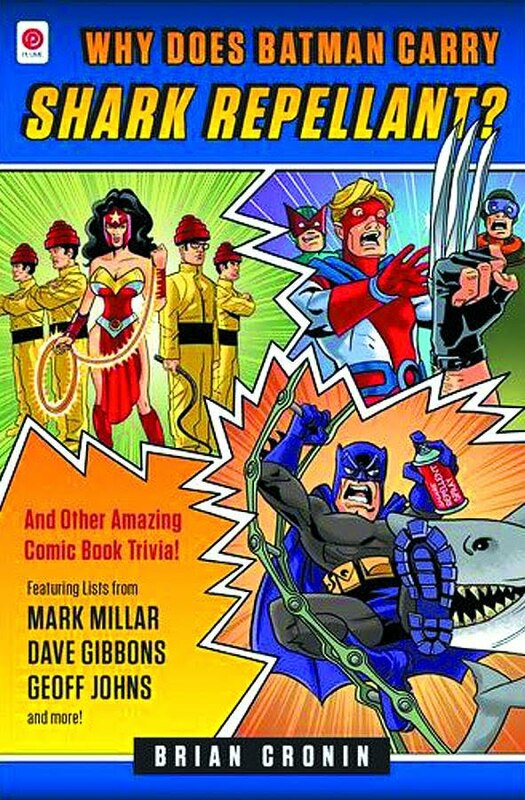 No mention of the Carl Burgos version of Captain Marvel. With other list titles that include "awesome", "great" and "top 25", there's no reference at all to Maus. No talk about Milton Caniff. And I honestly don't mean that as a complaint -- these are mostly lists compiled by one person, after all, and no one is going to agree with everything he places on them -- but it's an observation of the type of mindset that the book is geared towards. The book, while well-written and put together, was not written for someone like me. I enjoyed it for what it is, but I think I would've enjoyed it a lot more when I was hitting my local comic book shop every week and walking out with a stack of superhero comics. Brian Cronin's Why Does Batman Carry Shark Repellent? should become available on May 29.